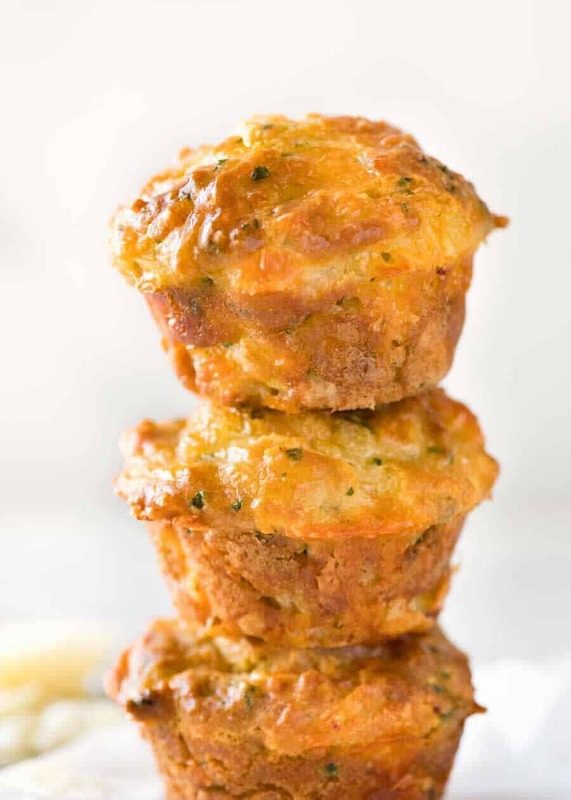 These Cheese Muffins will disappear in seconds! 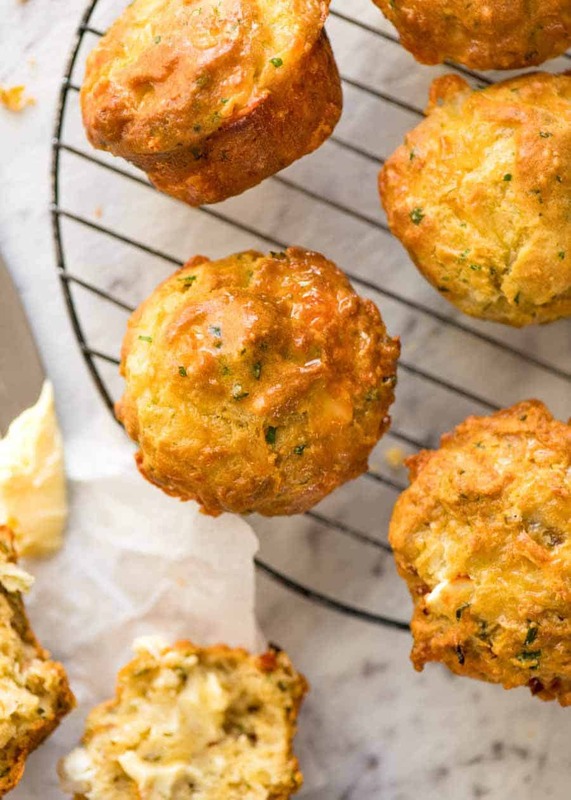 Quick and easy, sinfully moorish, these savoury muffins are buttery and garlicky with golden crusty tops and fluffy moist insides. Keep a stash for snacking, pop them in lunch boxes or serve a basket of these with dinner! 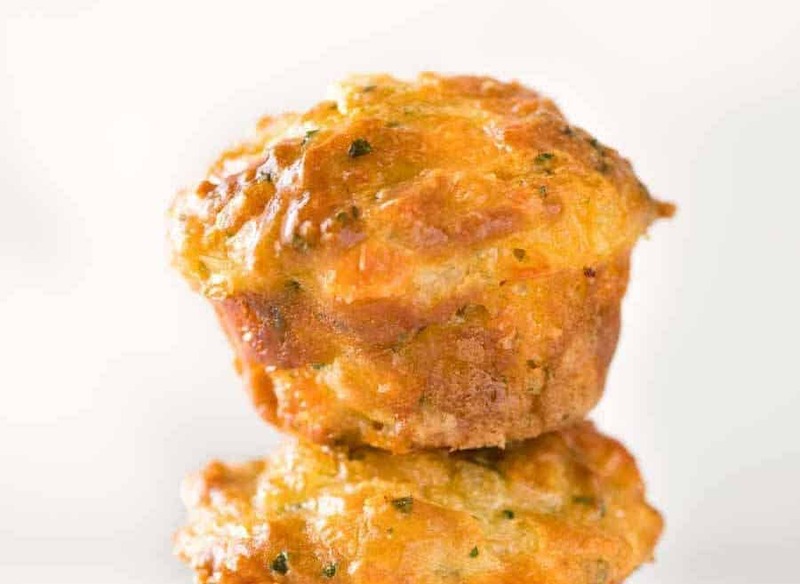 Cheese Muffins – a great savoury muffin recipe! 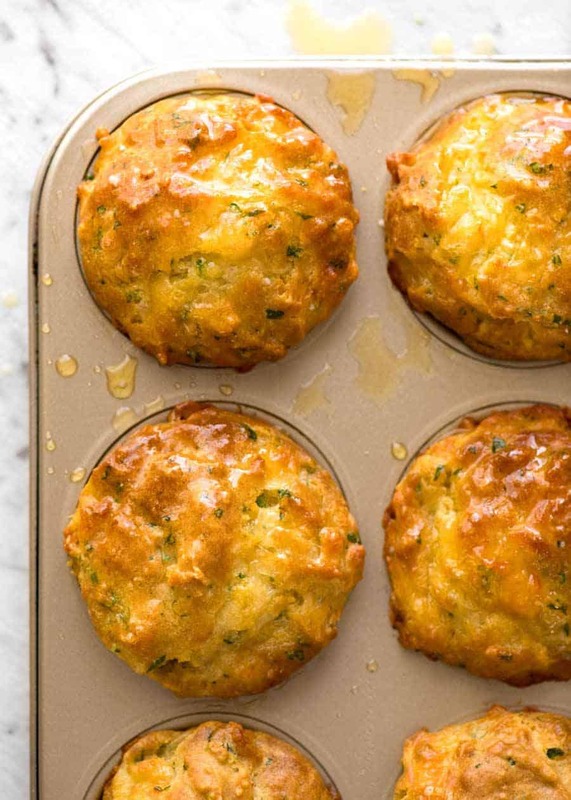 So basically, these muffins are every cheese-lovin’-Carb-Monsters’ dream come true. Inhale deeply, and you’ll get a waft of buttery garlicky goodness mingling with that unmistakable smell of melting cheese. Look closely, and you’ll feel the warmth radiating from these muffins, fresh out of the oven. That top one’s got your name written all over it. Go on. I saved it for you! OK, technology hasn’t advanced quite far enough yet that I can deliver you fresh-out-of-the-oven Cheese Muffins through a screen. But luckily, just 10 minutes of effort is all that stands between you and and a fresh batch of these! 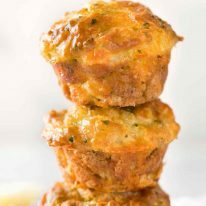 These Cheese Muffins are absolutely terrific as is, and it’s how I make them most of the time. Having said that though, it’s a sensational base for all sorts of add ins. Imagine the possibilities! I’ve used sun dried tomatoes, olives and feta in the photo below. Try mushrooms, spinach, zucchini (grated and excess liquid squeezed out), BACON, ham, chorizo, even cooked chicken. 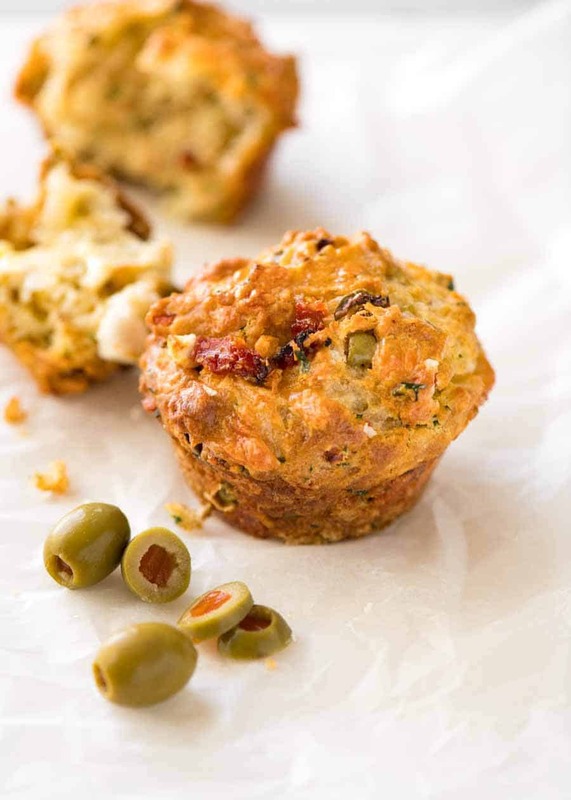 You could really turn these savoury muffins into a mini meal! I’ve added some more suggestions in the recipe notes – basically, just add 1 1/4 to 1 1/2 cups of whatever add ins you want. 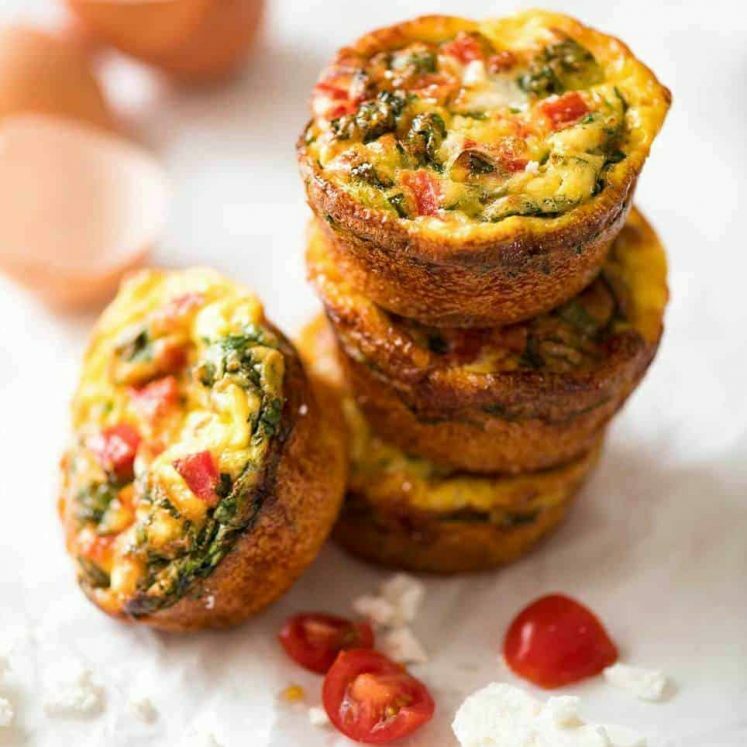 Bacon and Egg Breakfast Muffins – with a whole egg inside! 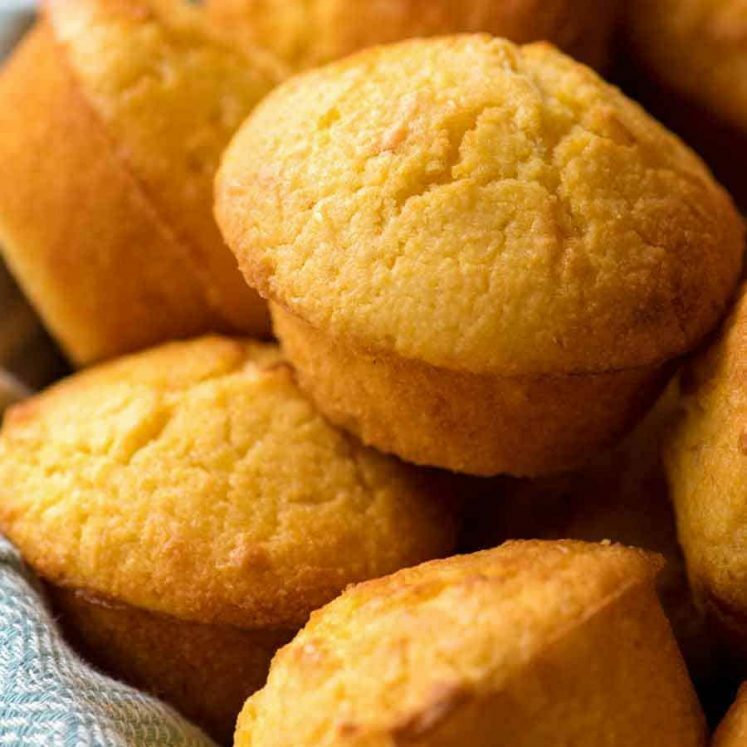 Cornbread Muffins – personal favourite! Recipe video above. 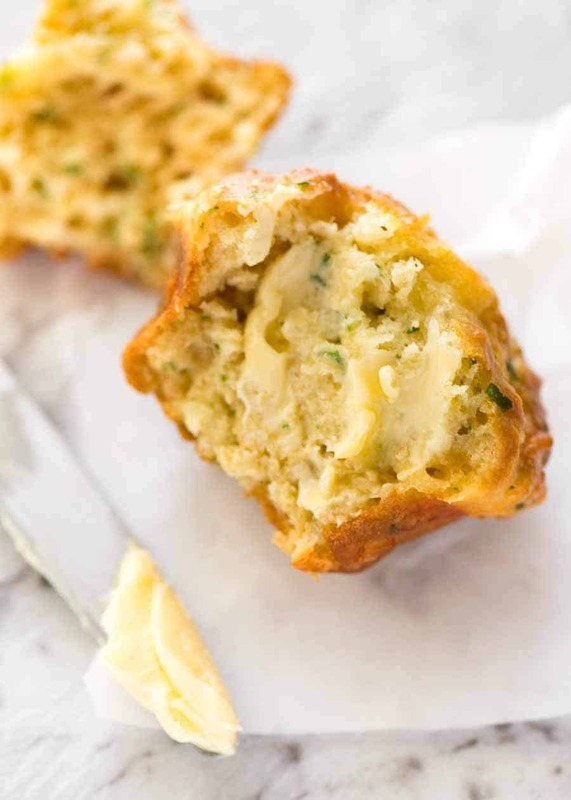 They taste like cheesy garlic bread - in muffin form! If you want lovely high domes as pictured, this makes 11 muffins. It's irritating, I know, but such is life. See notes for Add In options! Preheat oven to 180C/350F (standard) or 160C/320F (fan). Pour Wet into the Dry ingredients bowl. Mix 8 times. Add cheese, mix as few times as possible just to incorporate remaining bits of flour - no more than 7 big stirs (secret to soft muffs). Bake for 22 - 25 minutes or until the muffins are golden and crusty and spring back when touched in the centre. 1. I typically use grated Cheddar or Tasty Cheese (common in Australia). Any flavoured cheese will be terrific here, as long as it melts. Avoid Mozzarella - it doesn't have enough flavour. 2. 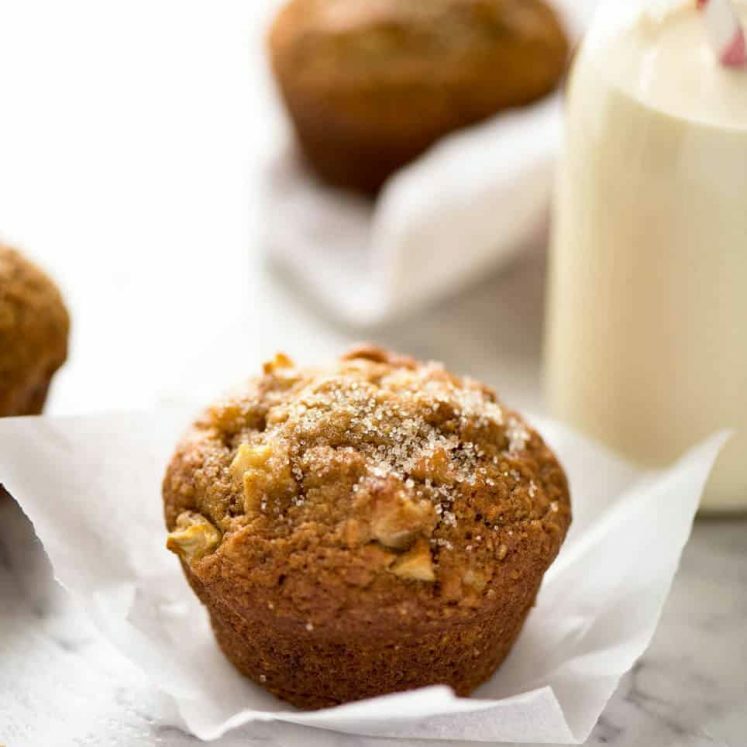 Baking soda gives these muffins a kick start with the rise so you get a lovely dome BUT if you don't have it, then you can use an extra 2 1/2 tsp of baking powder instead. OR use self raising flour instead of plain flour and no baking powder and no baking soda. 4. These stay fresh for 2 to 3 days in an airtight container. Best served warm. These can also be frozen for 2 - 3 months. 5. As always for baking recipes, I have made these using Australian cups (metric measurements used by the most of the world, including Europe, NZ) as well as US cups. I actually made these while I was in LA at a friend's house and they came out just as they do when I made them at home! 6. Add In options: Up to 1 1/2 cups of stir ins of choice, add with cheese. Sun dried tomatoes, chopped or large chunks of feta, chopped olives, ham, cooked bacon, grated zucchini (salt, leave for 20 minutes then squeeze out excess water), grated carrot, chopped spinach, bell peppers/capscium (cooked). Cooked mushroom slices, cooked chorizo, even chopped chicken. Let your imagination run wild! Makes 12 high dome muffins, or 13 - 14 sensible muffins. 7. 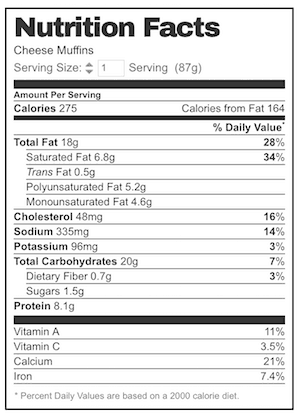 Nutrition per muffin, going all out as per the recipe. Skip the butter and it reduces to 248 calories each. In all seriousness though, he is doing just fine. Zonked out for most of the day. I am loving that harness he got sent home with. 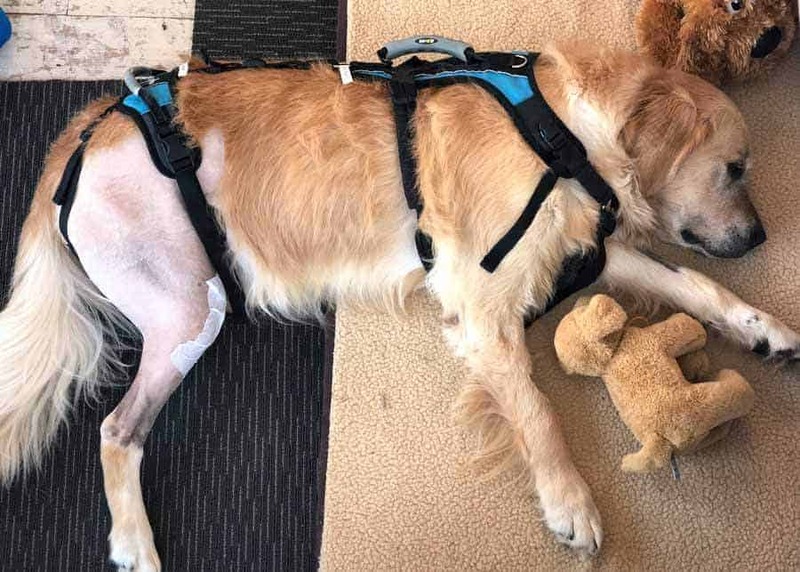 And so is Dozer – just that little bit of help to get him on his feet and hobble outside to the toilet. That’s the most action he’s going to get for a while!! I was asked to bring savoury muffins for an Easter Sunday brunch so made a test batch of these today. Omg, they are soooo good! Fluffy and light on the inside, golden and crunchy on the outside! Perfect hot out of the oven with a little butter ( or a lot! ). I sprinkled a little Parmesan on the top before baking but didn’t make any other changes. So glad I stumbled across this recipe ( and your site Nagi ). Your Red Velvet cake recipe is next on my to bake list! Hi Nagi! Thanks so much for the recipe! I’ve just tried it; the muffins are soft (despite my more than 8 little stirs, haha) and yummy! I didn’t do the garlic butter, I used muffin liners, used the entire 1 packet of grated cheese, put in 3 cloves of grated garlic, half tbsp of dried herbs, and 1 green chili and 1 red bird’s eye chili (cut finely for both). I’ll definitely make these again. I’ll probably add more herbs, garlic and up the spiciness! Terrific Farida, I’m glad you love them! I’m making an appetizer for my club’s wine tasting tomorrow. I think these sound perfect, but I have no sour cream or yogurt, and I can’t get out to shop. I’m going to try buttermilk. Let me know if this is a mistake,. Hi Carol, I haven’t tried with buttermilk – love to know if it works! I made these today with buttermilk! Turned out perfect 🤤 May add a tad more salt and a pinch of sugar next time though! Overall so damn good! Absolutely superb! I have been baking for six decades-best cheese muffins ever! I added Canadian bacon and red pepper, used cheddar and Manchego cheese! Three generations scoffed them down. Woah they sound amazing Judy!! I can’t wait to make these tmw! If I don’t have sour cream handy, can I subsitute it with something else? These were delicious! I made them in the morning and was worried that they wouldn’t be as nice by the afternoon but they reheated beautifully! I’m so glad you love them Nicole! Has anyone tried making this in a loaf pan?